A view through the Space Needle's glass floor. 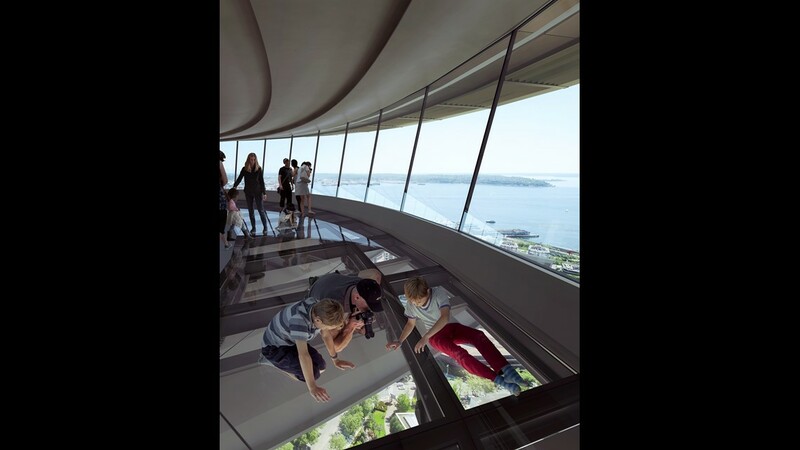 Seattle’s iconic, space-age inspired Space Needle marks a milestone in its $100 million makeover with the debut of its new rotating glass-floor observatory. 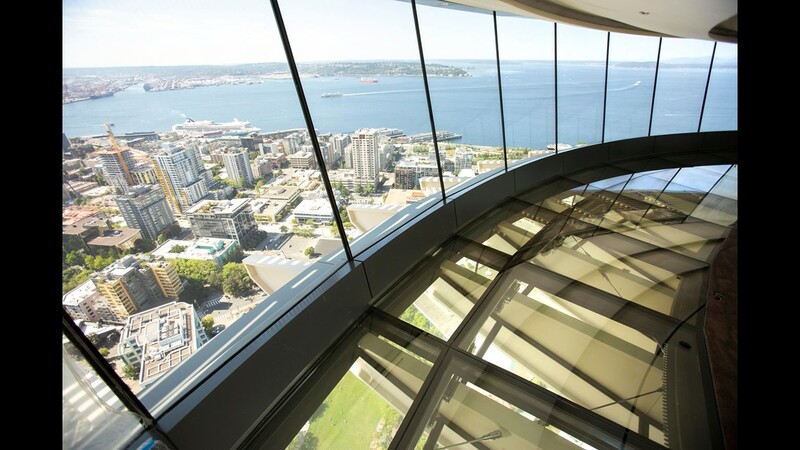 Seattle-based design firm Olson Kundig, the project architect, maintained the landmarked features of the building while significantly opening up the Observation Deck view with 48 floor-to-ceiling glass windows that are each 7 feet wide and 11 feet high. 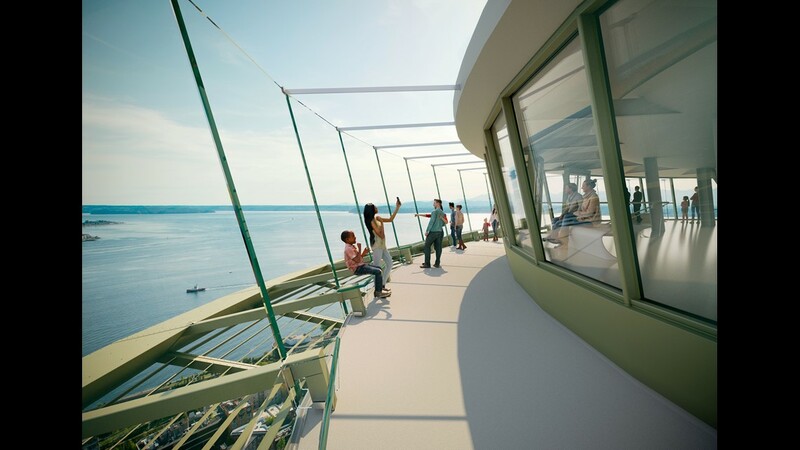 Visitors can enjoy a 360-degree view of Puget Sound and the Seattle skyline. 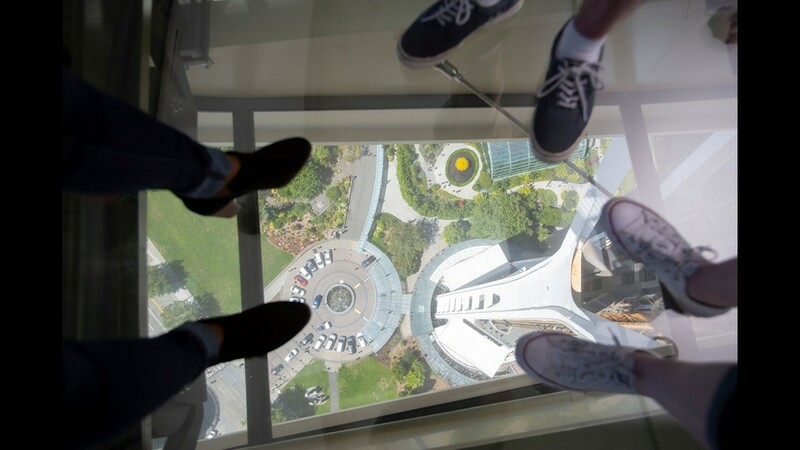 The glass floor makes a full rotation every 45 minutes. The previously installed glass benches and new observatory are popular photo vistas and selfie spots. Visitors can walk, stand, sit or stretch out on the new floor. 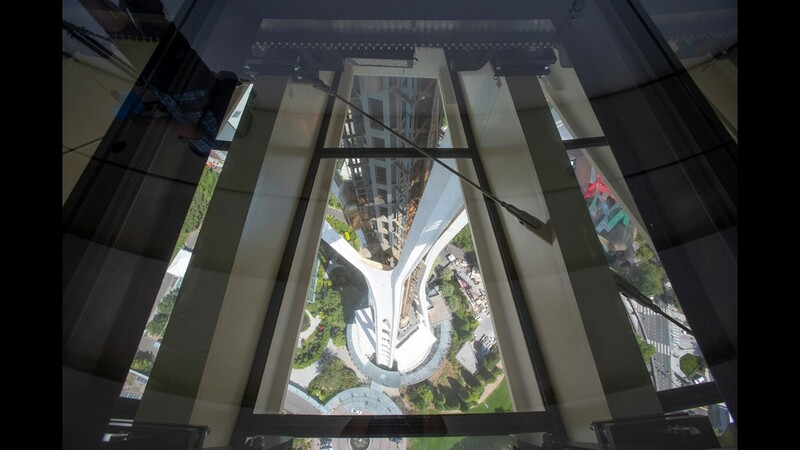 The mechanics of the rotating glass floor – or turntable – are also visible and include four motors and 48 rollers that can complete a rotation in varying lengths of time, from a quick 20 minutes to a glacial 90 minutes in either a clockwise or counter-clockwise direction. Expect to see a lot of feet photos from Space Needle visitors. View through the glass floor at the Space Needle. 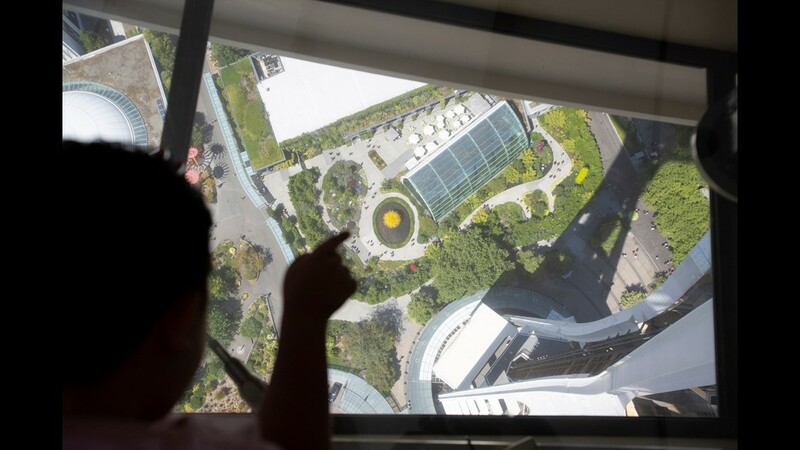 Admission to the Space Needle’s upper and lower observation decks ranges by time day from $27.50 to $37.50 for adults, with discounts for seniors and kids. 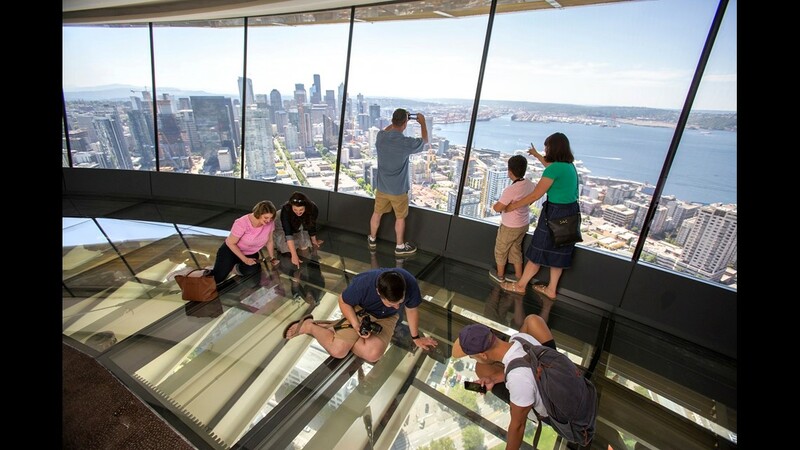 The world’s first and only revolving glass floor is now suspended and spinning – slowly – at the 500-foot level of Seattle’s iconic, 605-foot-tall space-age inspired Space Needle. 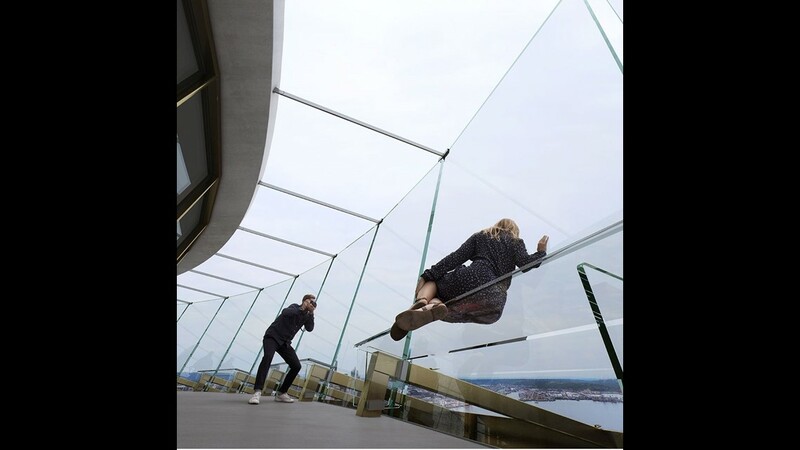 Dubbed “The Loupe” (a reference to the magnifying devices jewelers and watchmakers use), the Space Needle’s rotating glass floor is located just below the open-air observation deck and replaces the original (nonglass) revolving floor that was a feature of the Space Needle’s restaurant when it first opened at the 1962 Seattle World’s Fair. 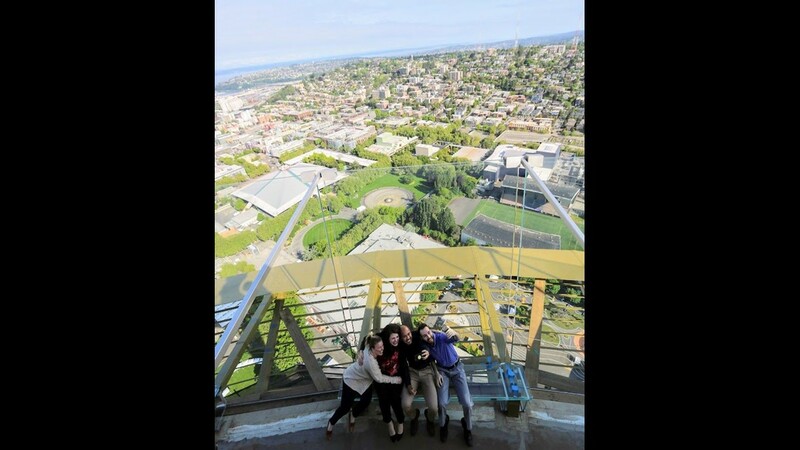 Visitors can walk, stand, sit or stretch out on the new floor and look down on the Space Needle’s architecture, the elevators and the elevator counterweights, the Seattle Center campus (an urban park with several museums and other attractions) and the city. 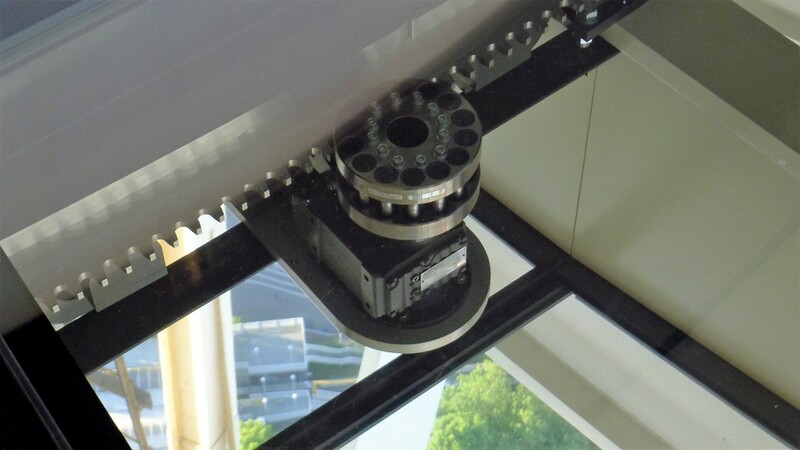 The mechanics of the rotating glass floor – or turntable – are also visible and include 12 motors and 48 rollers that can complete a rotation in varying lengths of time, from a quick 20 minutes to a glacial 90 minutes in either a clockwise or counter-clockwise direction. 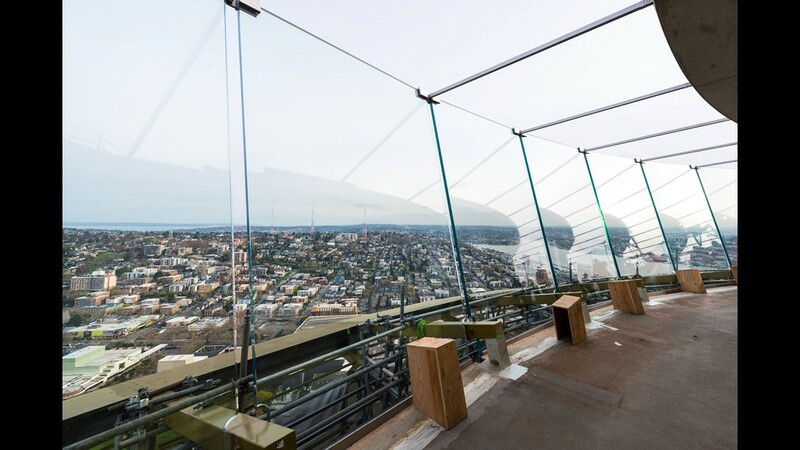 In May, the Space Needle marked another milestone in its $100 million makeover, with the unveiling of the first batch of specially slanted clear glass benches on the outdoor Observation Deck at the 520-foot level. 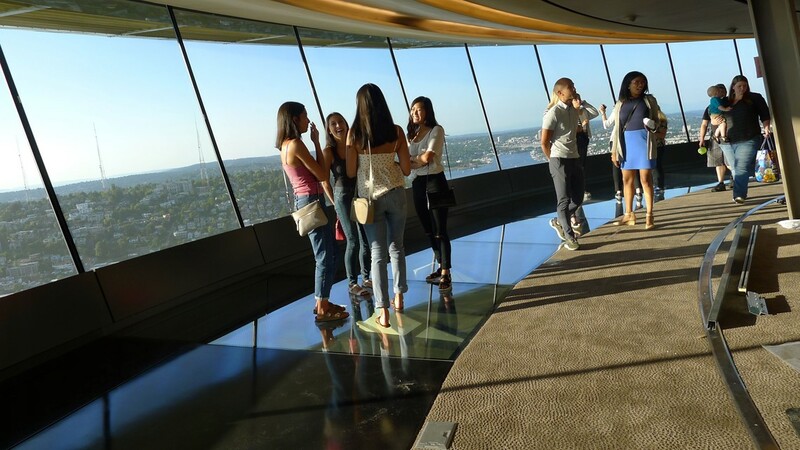 Now all 24 benches, dubbed “Skyrisers,” are attached to some of the viewing deck’s newly installed 11-foot-tall glass windows and invite visitors to lean back and snap selfies that will make them appear to be floating out over the landscape. 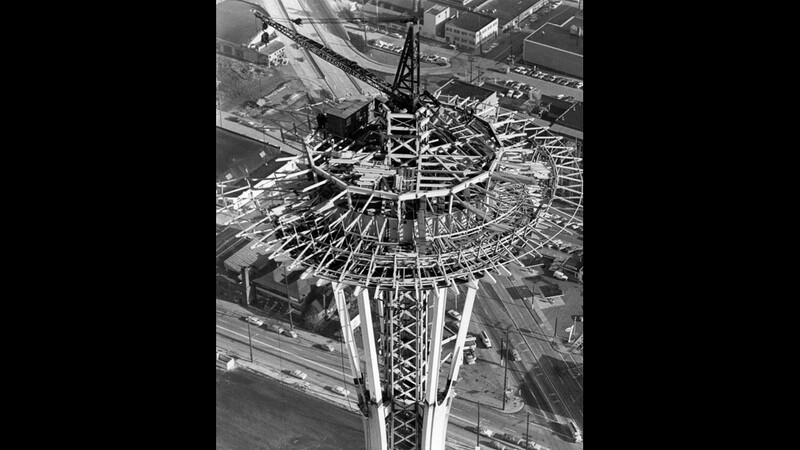 Over the past year, while the Observation Deck remained open to the public, construction workers replaced the view-obstructing but structurally necessary half-wall and caging installed when the 605-foot-tall Space Needle was built — in just 400 days — as a centerpiece for the World’s Fair held in Seattle in 1962. 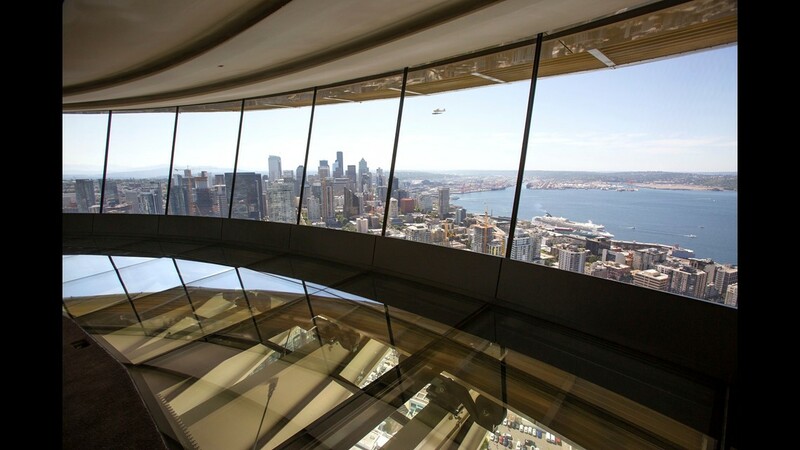 Seattle-based design firm Olson Kundig, the project architect, maintained the landmark features of the building while significantly opening up the Observation Deck view with 48 floor-to-ceiling glass windows that are each 7 feet wide and 11 feet high. 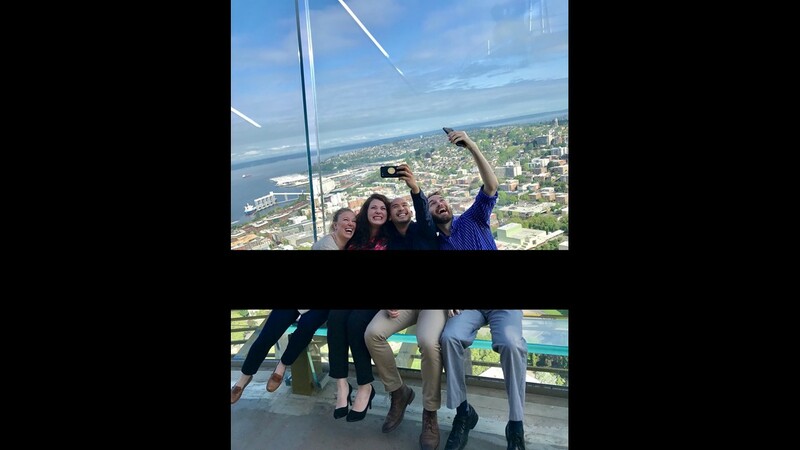 The group also added direct viewing lines to the outside for everyone who steps off the elevator, a state-of-the art ADA lift that (finally) makes the outdoor deck fully accessible, an indoor café and the newly unveiled inclined glass “Skyrisers” that will make a trip to the top of the Space Needle super selfie-worthy. Over the years there have been three different restaurant concepts in the rotating space, and this fall plans for the fourth restaurant will be announced. For now, there’s a wine bar. 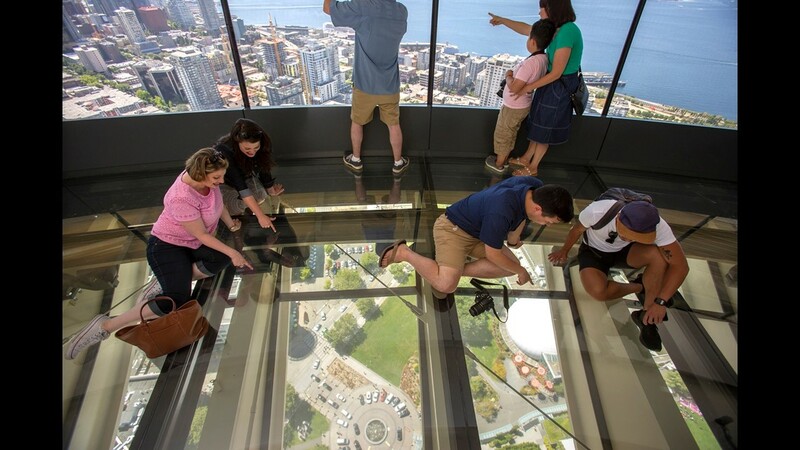 Inspired by the (nonrotating) glass floor the Eiffel Tower opened in 2014 and by the glass floors at Chicago’s Willis Tower and the Grand Canyon Skywalk, the rotating glass floor at the Space Needle offers visitors a view down at the fountain, the green spaces and museums on the 74-acre Seattle Center grounds. 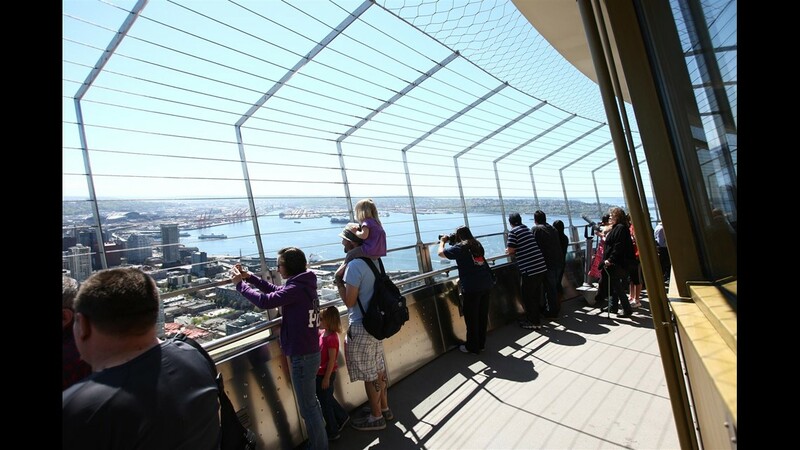 Admission to the Space Needle’s upper and lower observation decks ranges by time of day from $27.50 to $37.50 for adults, with discounts for seniors and kids. Discounted admission may be available with bundled attraction passes or some auto club and other organization memberships. 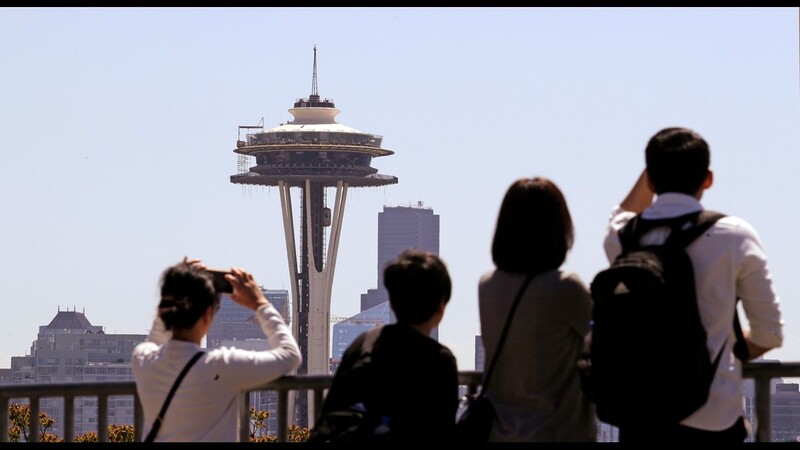 When to go: More than 1.3 million people visit the Space Needle each year, and lines can be especially long during the busy summer tourist season. Consider purchasing a timed-entry ticket online and visiting first thing in the morning or at the end of the evening. Summer hours: 8 a.m. to midnight. 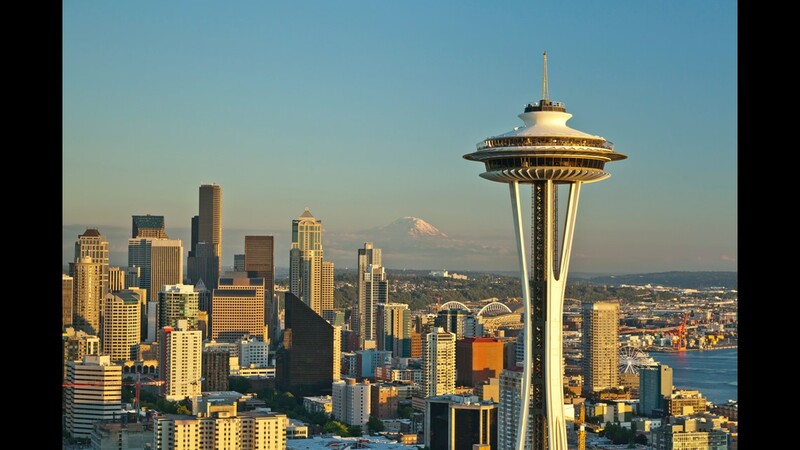 To get a unique view of the iconic 605-foot-tall Space Needle, plan a visit to the Sky View Observatory on the 73rd floor of the Columbia Tower in downtown Seattle. At nearly 1,000 feet, the observatory is the tallest public viewing area in the Pacific Northwest. The Space Needle in Seattle, with Mount Rainier in the background. A rendering of the new Observation Deck at night. A rendering of the world's first rotating glass floor. A rendering of the glass walls and benches that offer great views and photo ops. 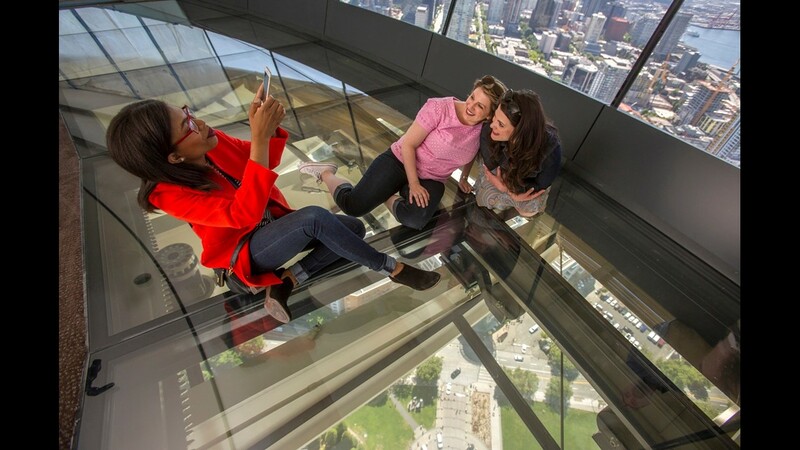 Inclined glass benches - called "Skyrisers" - and the deck's 11-foot-tall glass walls will allow visitors to snap super selfies. A rendering of the open circular stairwell connecting the two viewing decks. 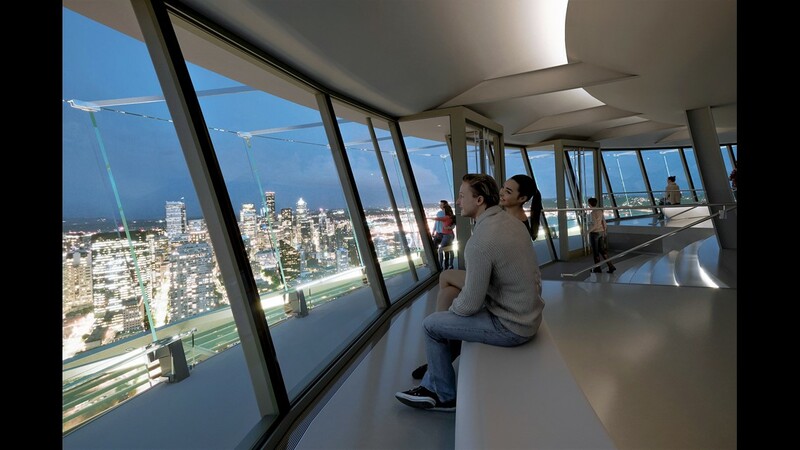 A rendering of the completed Observation Deck. Before the makeover, a wall and caging interrupted views from the Space Needle Observation Deck. The Space Needle Observation Deck before the makeover. 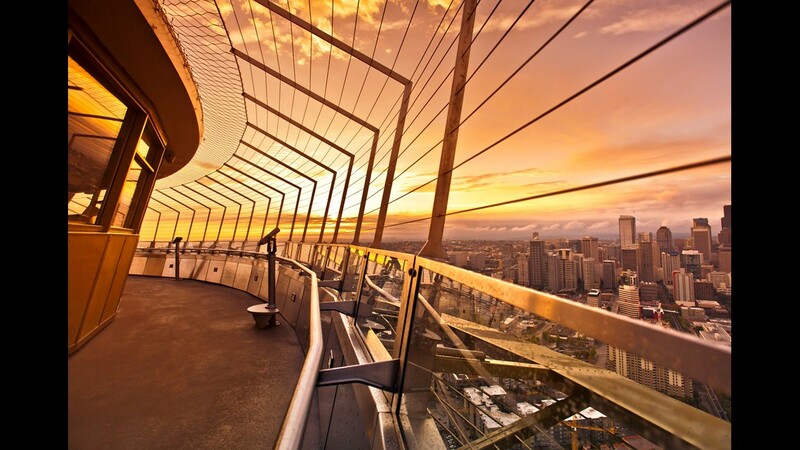 The Observation Deck at Seattle Space Needle, pre-makeover. 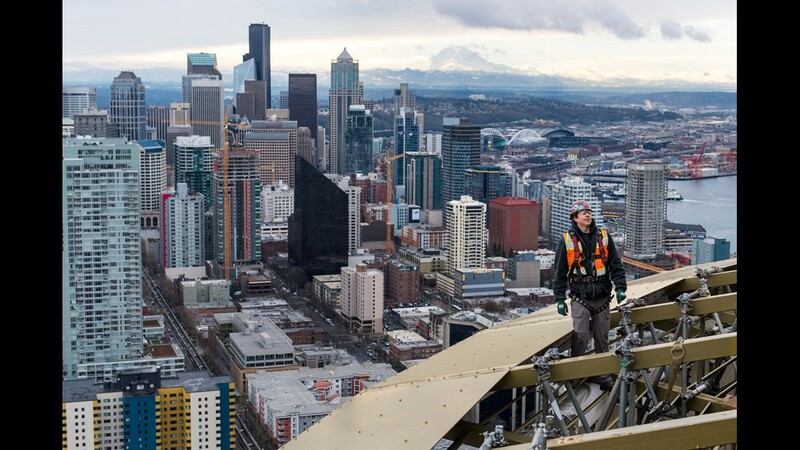 A worker out on the Space Needle "halo" during the makeover. 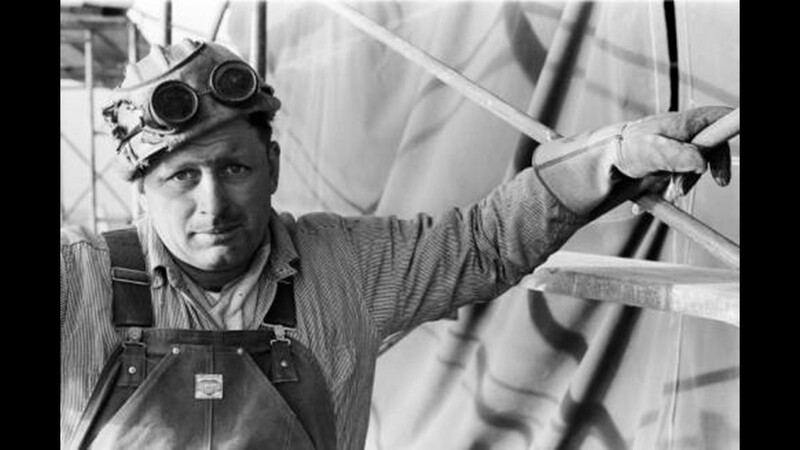 A worker installs an 11-foot-tall, 7-foot-wide glass panel. 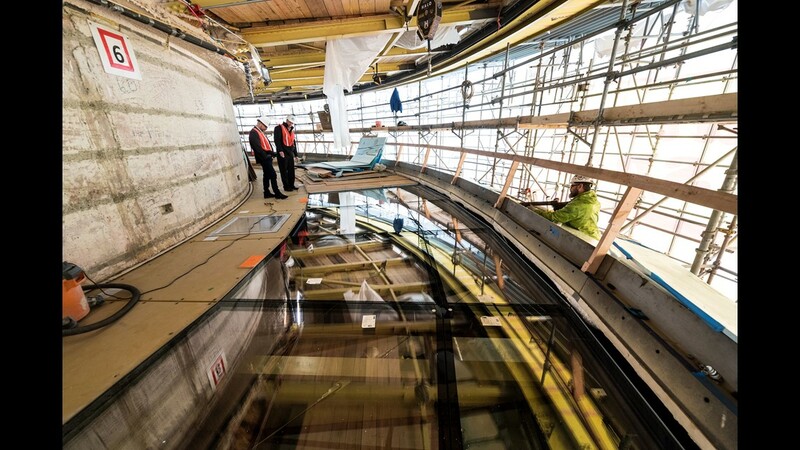 A section of the Space Needle's rotating glass floor under construction. 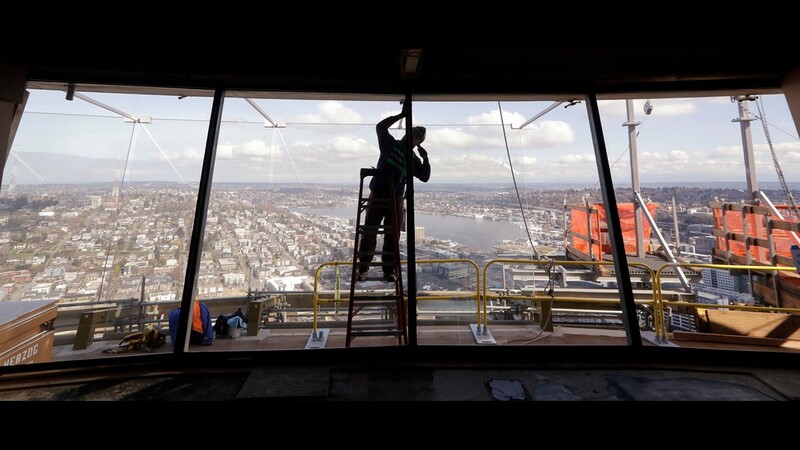 Workers install glass walls on Seattle Space Needle Observation Deck. Glass walls in place, glass benches to be installed. 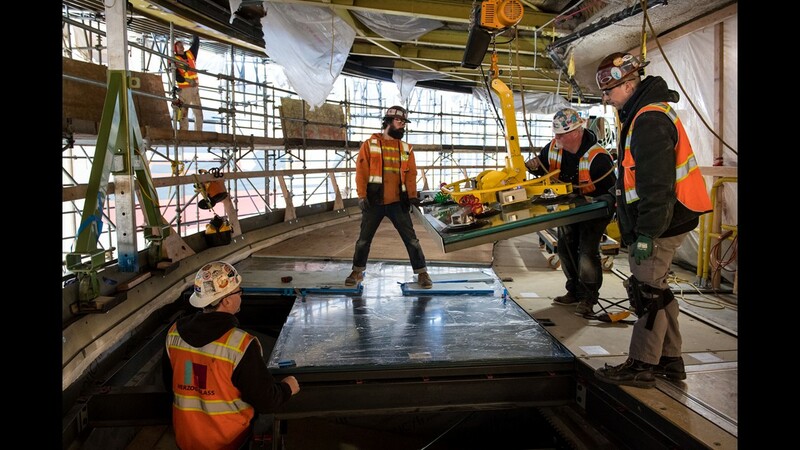 Workers install sections of the rotating glass floor on the lower level of the Space Needle Observation Deck. 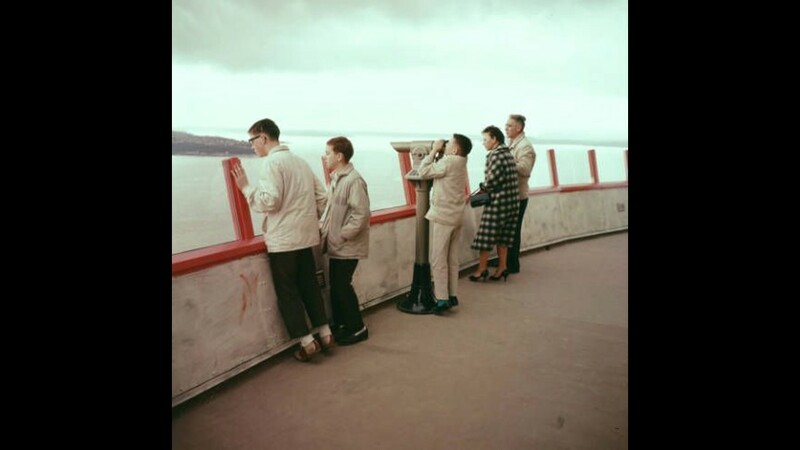 Visitors on the Space Needle Observation Deck in 1962. 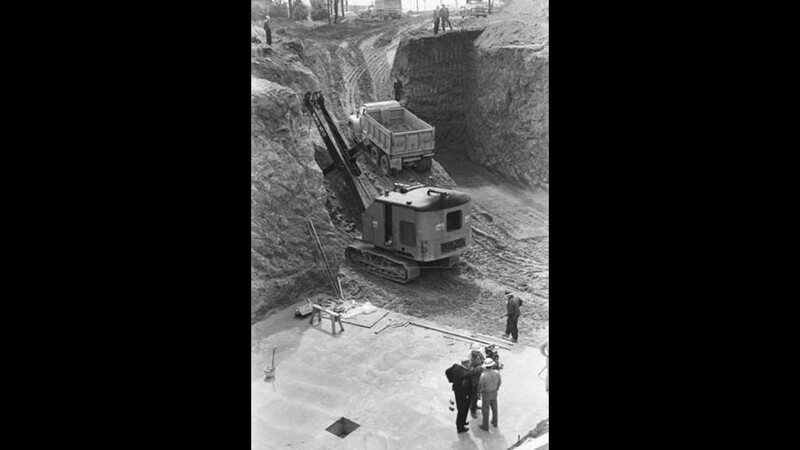 Excavating the Space Needle foundation, circa April 1961. Portrait of an unidentified Space Needle worker, circa January 1962. The Space Needle under construction for the 1962 World's Fair. 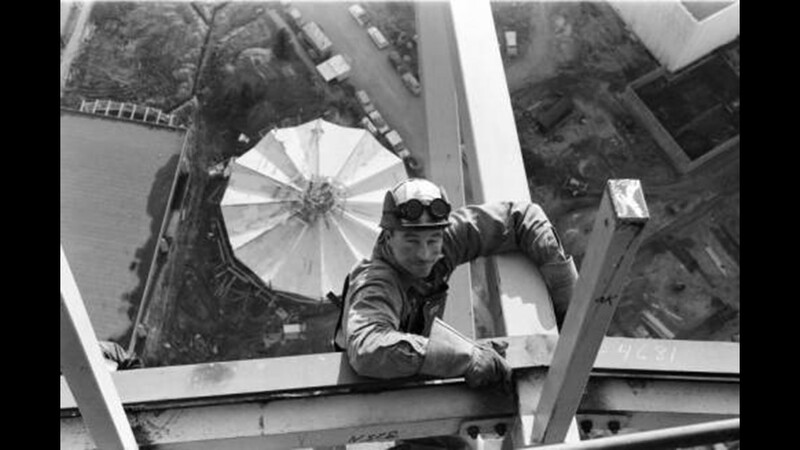 A worker on the Space Needle, circa January 1962. 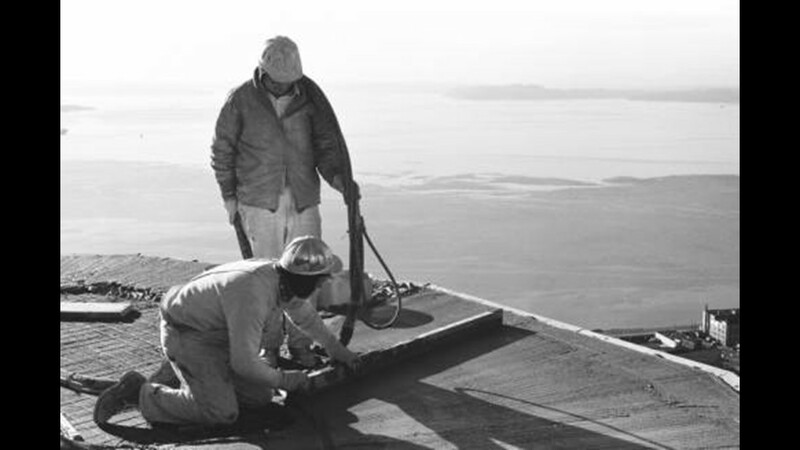 Workers install screening on the Space Needle roof in early January 1962. 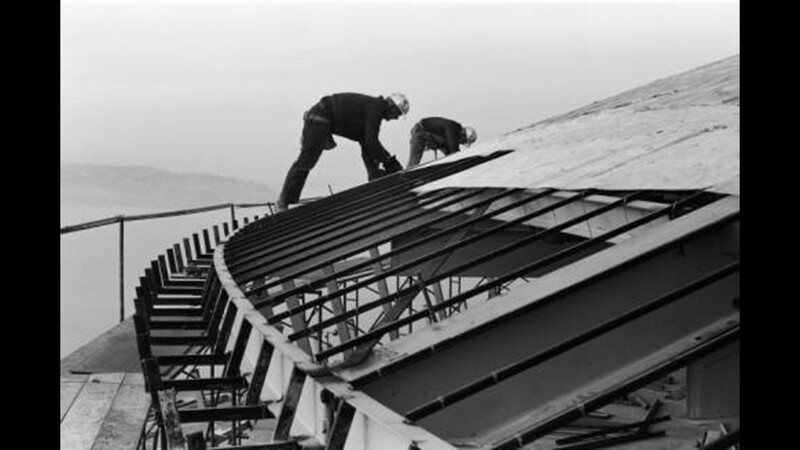 Workers plaster the Space Needle roof in early January 1962. 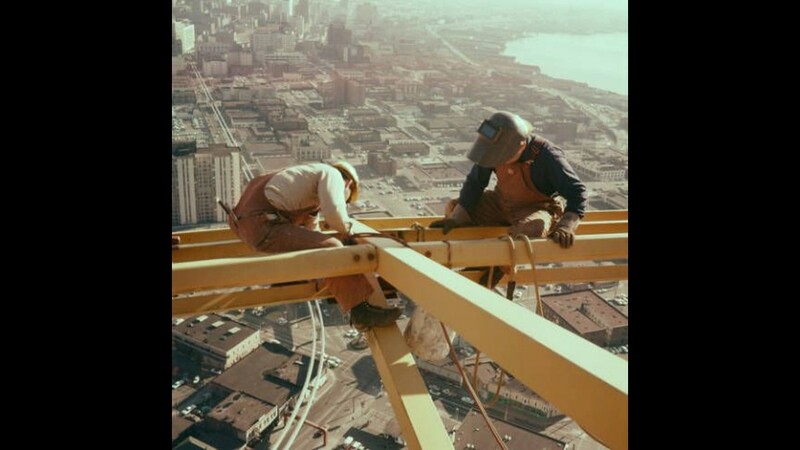 Workers weld beams at the top of the Space Needle, circa January 1962. 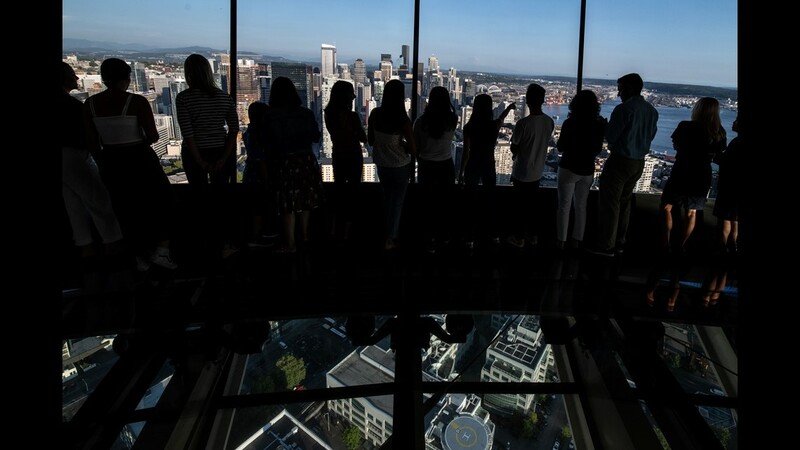 Tourists look across at the Space Needle, where a floor of scaffolding remains below the upper portion, in Seattle on May 22, 2018. The family-owned landmark is set to unveil phase one of the biggest renovation in its 56-year history in June 2018, a $100 million investment that transformed the structure's top viewing level some 500-feet above ground. 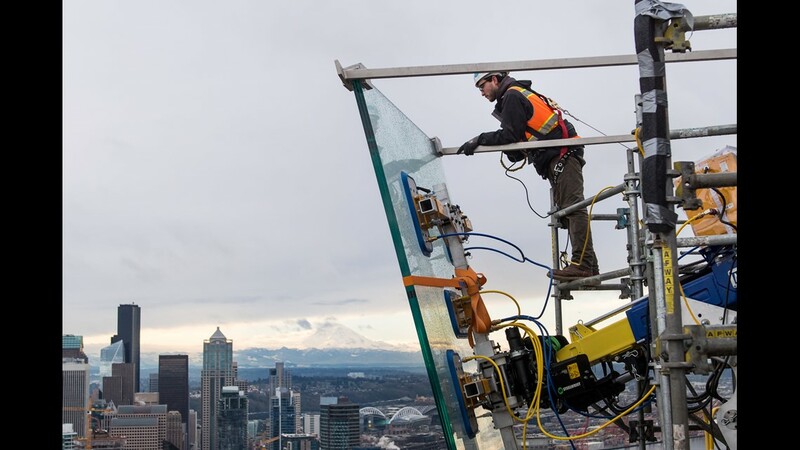 A glazer works on glass panels on the exterior wall of the Space Needle observation deck where larger glass panels line the exterior viewing platform on March 20, 2018. 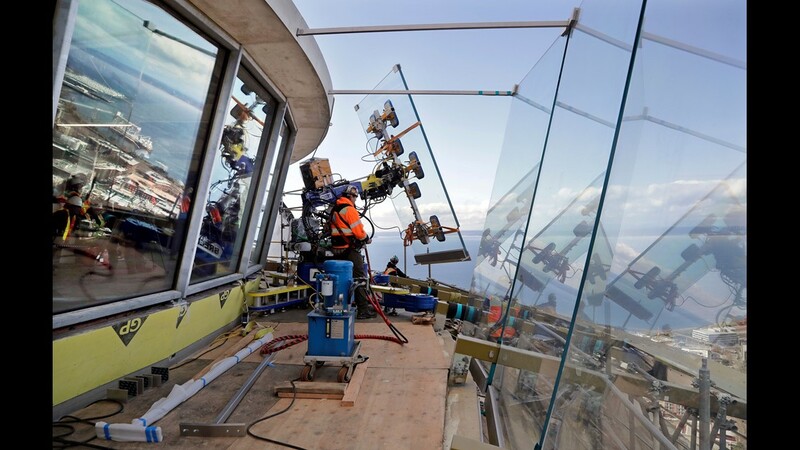 The renovation work will include the replacement of wire barriers on the observation deck with outward-slanted glass and short exterior walls will be replaced with the floor-to-ceiling glass panels. 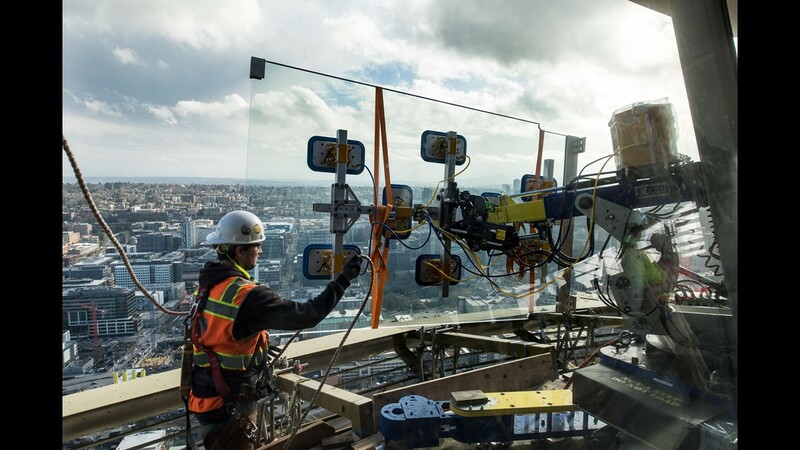 A one-ton glass panel is moved into position on the Space Needle's observation deck on March 20, 2018. 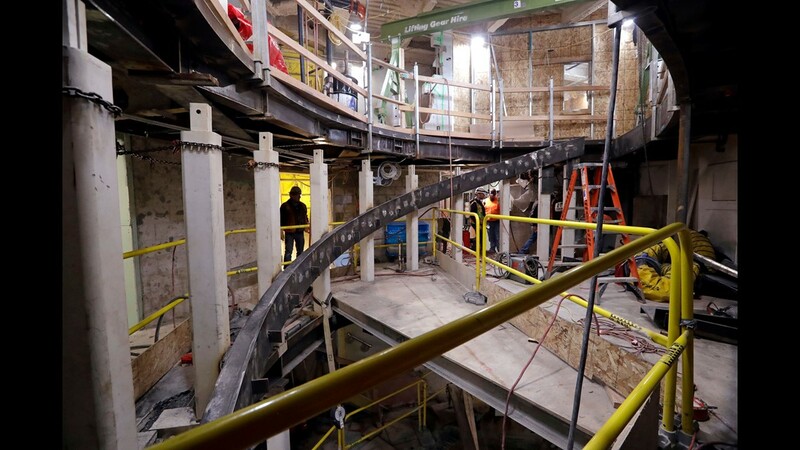 Subsequent phases of the project will include the full completion of the new dining experience, updating the elevators, as well as repainting the structure. 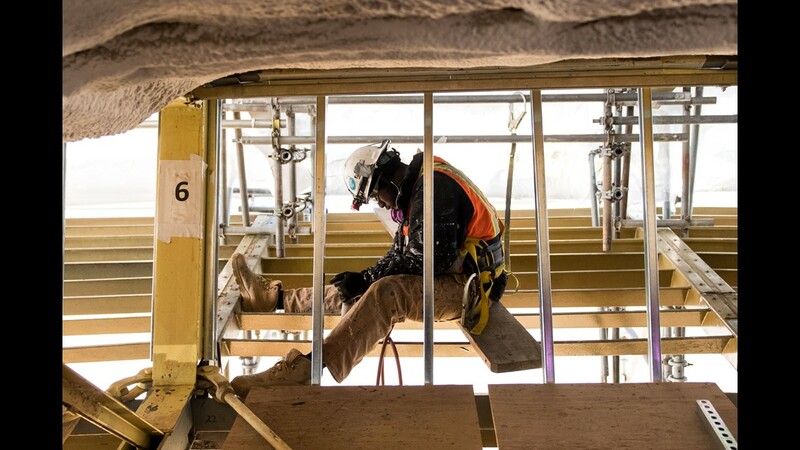 Construction work continues on a stairwell in the Space Needle on April 18, 2018. The preservation and renovation project includes the installation of floor-to-ceiling glass on the viewing deck, updating the structure's physical systems and adding a glass floor to the rotating restaurant. 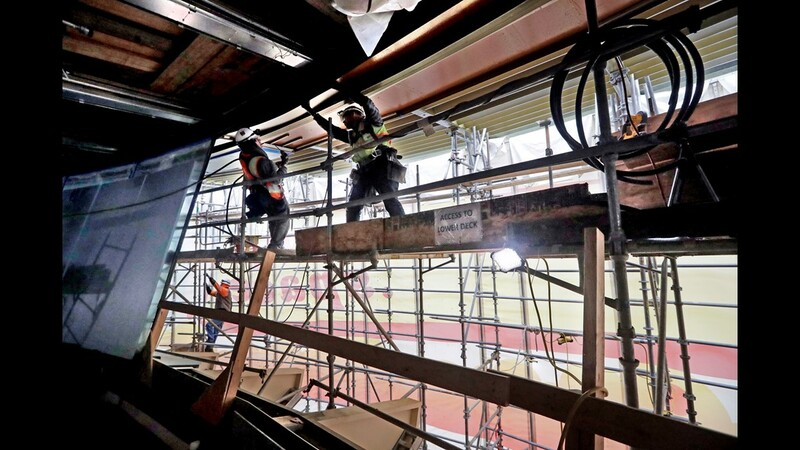 Construction workers renovate the restaurant level of the Space Needle on April 18, 2018. 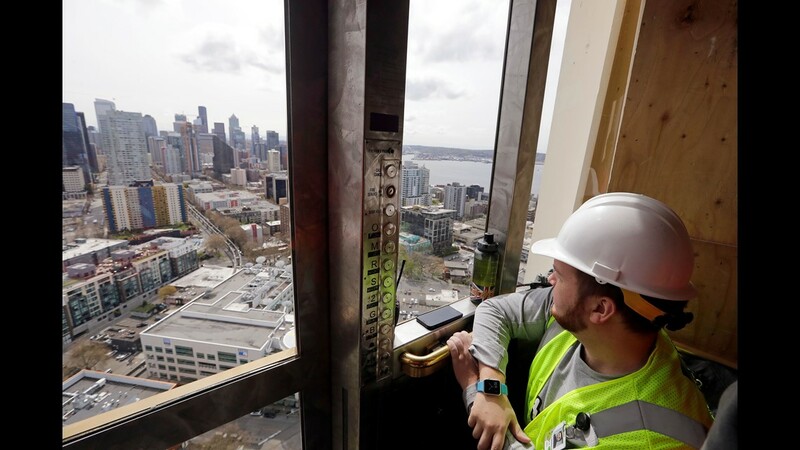 A construction worker looks toward downtown from an elevator in the Space Needle on April 18, 2018. 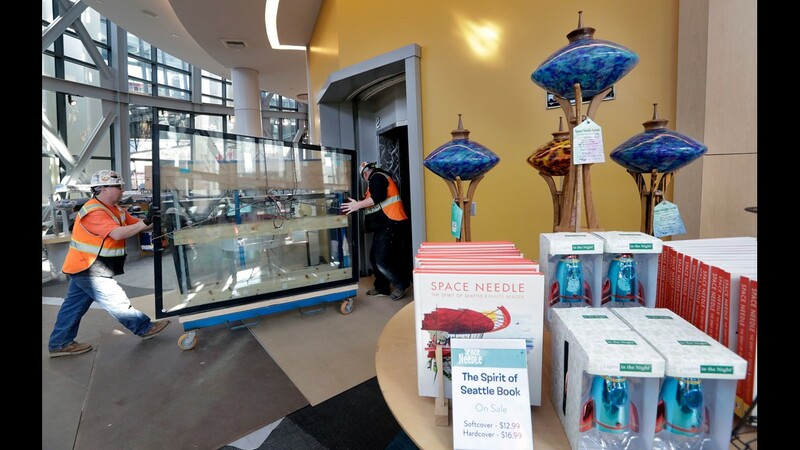 Glazers move glass panels for the restaurant floor through a Space Needle gift shop on March 20, 2018.
construction worker Robert Hidgon looks at plans for a restroom in the Space Needle on April 18, 2018. Scaffolding remains below the upper portion of the Space Needle on May 20, 2018. 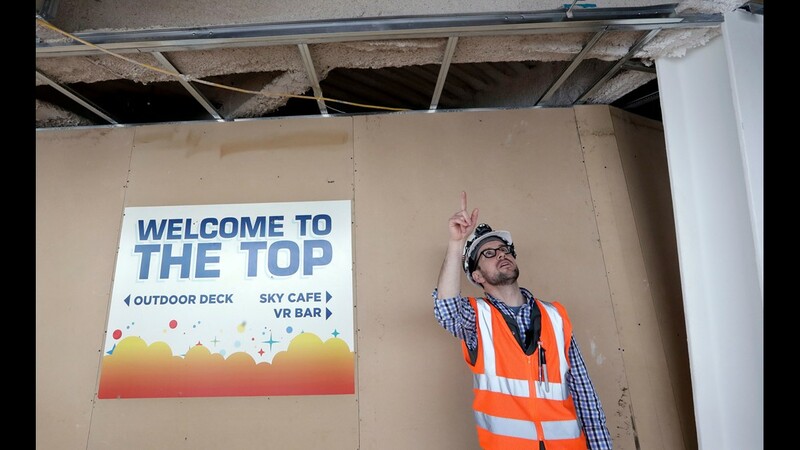 Space Needle facilities and construction superintendent Matt Waffle points out work being done on the ceiling on the viewing level of the landmark structure on April 18, 2018. 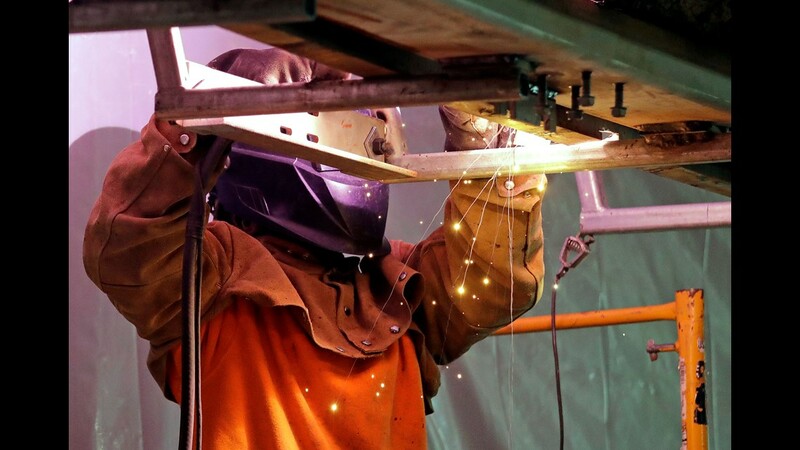 A welder works on the viewing platform of the Space Needle on April 18, 2018. 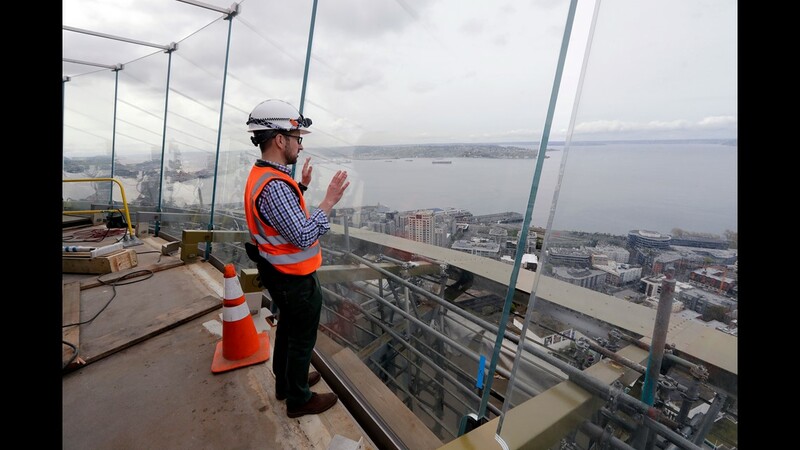 Space Needle facilities and construction superintendent Matt Waffle looks out over Elliott Bay through the newly-installed glass panels in the Space Needle on April 18, 2018. 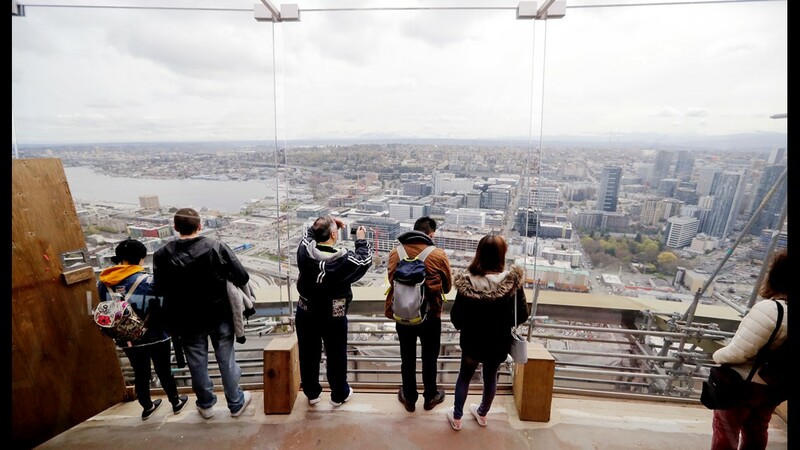 Visitors on the viewing platform of the Space Needle look east through the newly-installed glass panels on April 18, 2018. 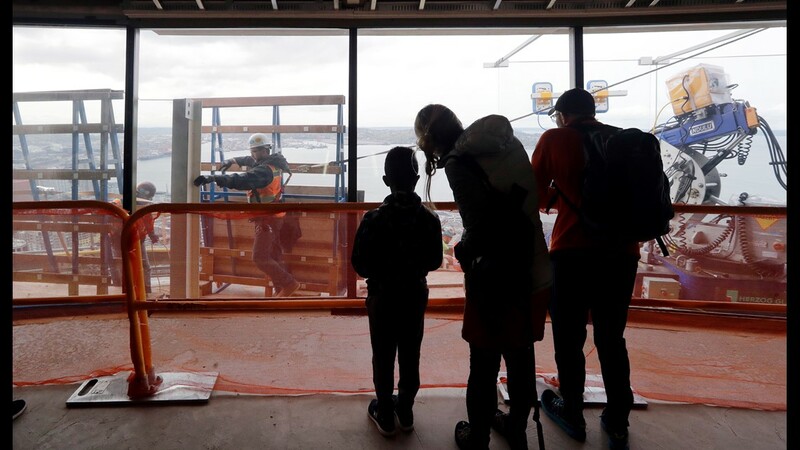 Visitors to the Space Needle watch construction workers move large pieces of glass into position on the viewing platform of the structure on April 18, 2018. Workers climb on the roof of the Space Needle on Feb. 7, 2018. 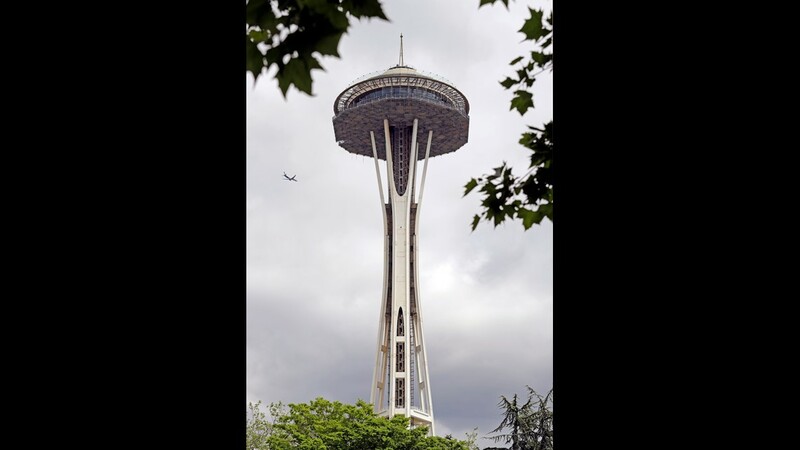 Space Needle, 1962 (Architect: John Graham & Company): Seattle’s most iconic landmark, the Space Needle's futuristic style has continued to mark Seattle as a hub of innovation since its construction for the 1962 World's Fair. 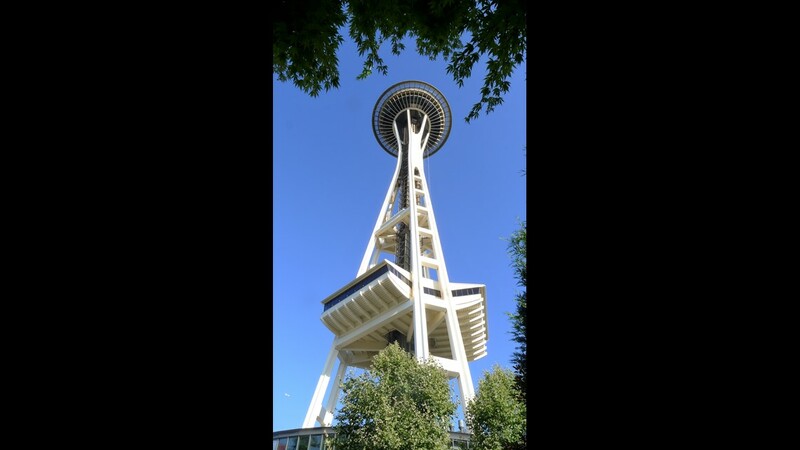 Inspired by Germany's Stuttgart Tower, the architecture of the Space Needle is the result of a compromise between the designs of two men, artist Edward E. Carlson and architect John Graham, Jr. 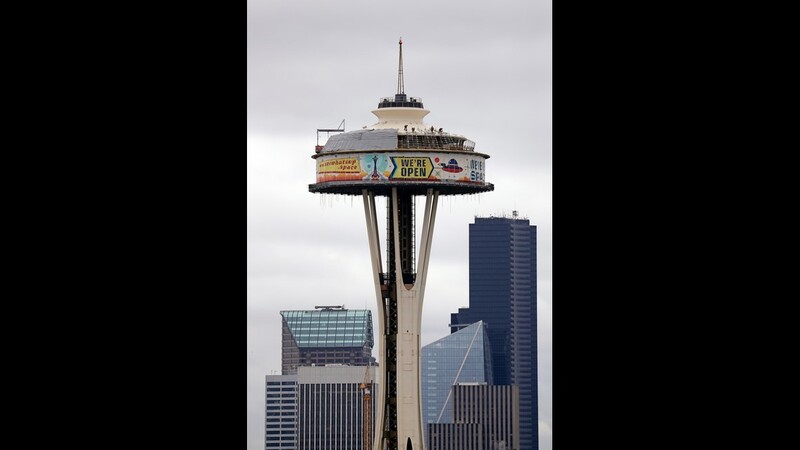 The 605-foot observation tower was the tallest building in Seattle and Washington State from 1962-1969, and is built to withstand winds up to 200 mph and earthquakes of up to 9.1 magnitude. 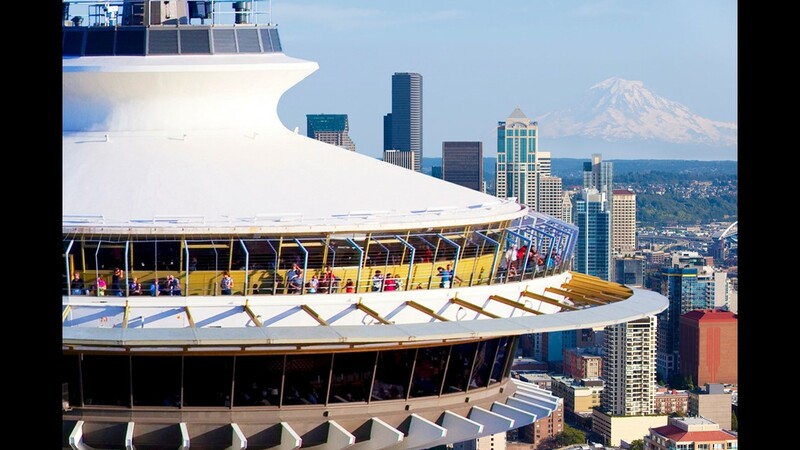 Visitors can ride the elevators to the top of the Space Needle where, on a clear day, they can take in the 360-degree view of the downtown Seattle skyline, Olympic and Cascade Mountains, Mount Rainier, Mount Baker, Elliott Bay and surrounding islands from the observation deck or while enjoying a meal at the rotating SkyCity restaurant. The Space Needle is located on the Seattle Center campus, and is among many arts, education, entertainment and tourism attractions that continue to flourish on the 74-acre campus designed for the 1962 World’s Fair by architect Paul Thiry, including Thiry’s futuristic Coliseum (now Key Arena) and the U.S. Science Pavilion (now the Pacific Science Center) designed by Minoru Yamasaki. Seattle Central Library, 2004 (Architects: Office for Metropolitan Architecture and LMN Architects): The flagship library of the Seattle Public Library system, Seattle Central Library was the recipient of a 2005 national AIA Honor Award for Architecture, as well as an ACEC Washington Platinum Award for innovation and engineering. The 11-story glass and steel building in the heart of downtown Seattle has the capacity for over 1.5 million books and is an innovative example of function dictating architectural form. Notable features include the four-story continuous "Books Spiral" which houses the entirety of the library's non-fiction collection without the interruption of multiple floors or sections, the 275-seat Microsoft Auditorium, 400 free public computers, and the third floor café with a designated seating area for the consumption of food and beverages. Bullitt Center, 2013 (Architect: Miller Hull Partnership): Certified Living Building Challenge recipient, inaugural winner of the AIA Seattle Energy in Design Award and first U.S. commercial building to receive Forest Stewardship Council (FSC) Project Certification, the Bullitt Center was designed to be the "greenest commercial building in the world." Built in the dense urban Capitol Hill neighborhood of Seattle, the Bullitt Center is a leading example of how sustainable design compliments and enhances the contemporary design aesthetic. The high degree of operable windows located within 30 feet of all workstations ensure workers access to fresh air and natural light at all times. 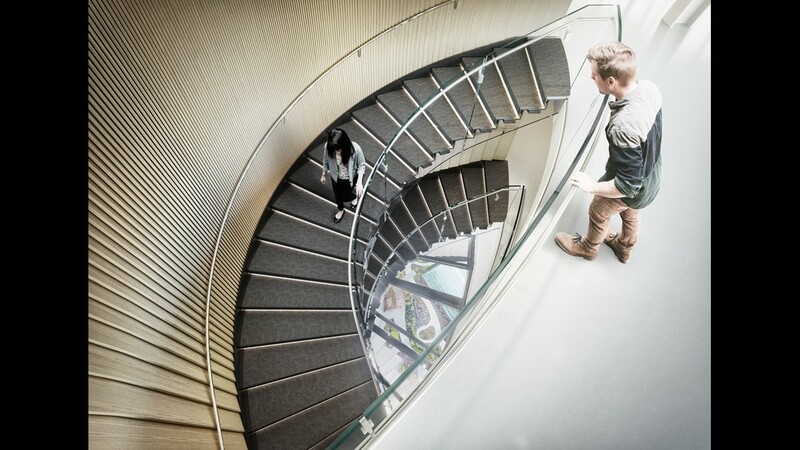 The Bullitt Center is also designed to promote walkability, with large, inviting stairways, as well as communal workspaces that promote collaboration and resource-sharing. Rainwater, plentiful in Seattle, is collected and stored in underground cisterns to be used throughout the building, while a solar array generates as much as 60% more than the building consumed in 2014. Several other high-efficiency features of include toxic-free materials, composting toilets, and FSC wood. Chapel of St. Ignatius, 1995 (Steven Holl): Seattle University's main chapel, the Chapel of St. Ignatius is a landmark example of ultra-modern religious architecture. Envisioning the chapel as a "gathering of different lights," architect Steven Holl harmoniously combines the architectural and spiritual needs of the structure and the student body. During the day each part of the chapel is illuminated with different colors of light, which filters in through colored glass and reflects off of painted color fields on the back of suspended baffles. Each color of light meant to represent a different pillar of Catholic worship. The chapel received an AIA New York design award, and a scale model is permanently housed at the Museum of Modern Art in New York. Suzzallo Library, 1926, 2000 (Architects: Charles H. Bebb, Carl F Gould; Bindon & Wright): Situated on the urban campus of the University of Washington Seattle, Suzzallo Library is a textbook example of the highly ornate Collegiate Gothic style. The façade is decorated with 18 terracotta figures, from Moses to da Vinci to Darwin, as well as cast stone figures depicting the personifications of Mastery, Inspiration and Thought by Tacoma sculptor Alan Clark. The Graduate Reading Room with its high vaulted ceilings is richly adorned with gilded details and large oak bookcases decorated with hand-carved friezes of native flora. The highly modernist 1963 addition by architects Bindon & Wright was designed to bring harmony between the traditional gothic style and the surrounding campus buildings. MoPOP (formerly Experience Music Project aka EMP), 2000 (Architect: Frank O. Gehry; LMN Architects): Located on the Seattle Center Campus along with the Space Needle, the Museum of Pop Culture (MoPOP) is home to the largest collection of Jimi Hendrix memorabilia in the world. Designed by Canadian-American architect Frank Gehry — best known for the Guggenheim Museum Bilabo and Walt Disney Concert Hall — MoPOP’s exterior evokes the smashed Stratocasters of the Rock ‘n’ Roll legends the institution pays homage to. The sheet-metal construction and exposed building material add to the deconstructionist effect. Amazon Spheres, projected 2018 (NBBJ): Scheduled to open in 2018, the Amazon Spheres are a revolutionary mashup between office building and botanical garden. Located on Amazon’s metropolitan campus in Seattle’s Downtown Denny Triangle neighborhood, the 65,000-square-foot glass and steel biospheres feature informal seating and meeting space for Amazon employees seeking respite from desk life. Home to more than 400 botanical species, the temperature is set to 72 degrees with 60% humidity. Despite the rigid climate control, the building is on track to receive LEED Gold certification. The striking visual form and unconventional function have set the Amazon Spheres on the path to becoming a Seattle icon to rival the Space Needle. The spheres received a 2016 AIA Seattle Honor Awards Honorable Mention, as well as taking second place in the Seattle Design Review Program’s 2017 People’s Choice Awards, High-rise Category. Tacoma Narrows Bridge, 1940, 1950, 2007 (Engineer: Leon Moisseiff; Clark Eldridge): At the time of construction, the Tacoma Narrows Bridge, spanning the Tacoma Narrows strait and connecting Tacoma and the Kitsap Peninsula, was the third longest suspension bridge in the world. Dubbed "Galloping Gertie" by construction workers who witnessed the original bridge's vertical motion in windy conditions, the bridge opened to traffic on July 1, 1940; however, it famously collapsed into the Puget Sound just four months later on Nov. 7, 1940, due to aeroelastic flutter caused by high winds. The collapse spurred further research in the field of bridge aerodynamics-aeroelastics, “the study of which has influenced the designs of all the world's great long span bridges built since." The bridge was eventually replaced in 1950, and in 2007 a second bridge was constructed to carry eastbound traffic. Pioneer Square (Architect: Multiple; Elmer H. Fisher, original): The birthplace of modern Seattle, Pioneer Square is a neighborhood on the southwest corner of downtown Seattle, characterized by its late-19th-century brick and stone architecture. Originally home to the Suquamish and Duwamish tribes, the site was settled in 1852 by Henry Yesler as the location for the Puget Sound's first steam-powered lumber mill. Many of the neighborhood's original wooden structures burned in the Great Seattle Fire of 1889, and in the rebuilding phase "city engineers took the opportunity to solve Pioneer Square's chronic drainage problems by elevating its street level a full story. This isolated some of the new buildings' original ground floor businesses in subterranean sidewalk spaces." Visitors can take the Seattle Underground Tour to experience what remains of the original street level. In 1970, the Pioneer Square-Skid Road Historic District was listed on the National Register of Historic Places and today is home to art galleries, cafes, bars and offices. Pike Place Market, 1907 (Developer: Frank Goodwin): Pike Place Market in downtown Seattle is one of the oldest continuously operated public farmers' markets in the U.S. and remains Seattle’s central marketplace of locally produced foods and goods. In 1970 the Pike Place Public Market Historic District was listed on the U.S. National Register of Historic Places and throughout the 1970s, all of the market's historic buildings were restored and renovated using the original plans and appropriate materials. Renovations and additions continue today with the new MarketFront completed in the summer of 2017. Paradise Inn, 1916 (Architect: Heath, Grove and Bell; Ranier National Park Co.): Built in the traditional Rustic style favored by the National Park Service, Paradise Inn is a historic hotel sitting at 5,400 feet on the south slope of Mount Rainier in Mount Rainier National Park. Declared a National Historic Landmark in 1987, the inn is constructed from native materials including cedar shingles, native rock and fire-weathered timbers salvaged from the adjacent Silver Forest. The Paradise Inn resembles a Swiss chalet in structure, down to the exposed interior timber framing and craftsman décor. Visitors can visit the Henry M. Jackson Visitor Center and the 1920 Paradise Guide House, which are also at this location. Spokane County Courthouse, 1893, (Architect: Willis Alexander Ritchie): A masterly replica of 16th-century French Renaissance design, the Spokane County Courthouse has its origins in the city's financial panic of 1893. Conceived in part as a stimulant for the faltering economy, the Board of County Commissioners opened a design competition for the new structure of "brick and stone, or stone as near fireproof as practical, to include commodious vaults for records, plumbing, heating, sewerage, closets, and everything necessary for the courthouse and jail to cost no more than $250,000." The winning design, by architect W. A. Ritchie, is castle-like, recalling the famous 16th-century Chateau de Chambord and Chateau d'Azay le Rideau in the Loire Valley of France, and boasts exquisite details from the iron and brickwork to the decorative arches and exterior trim featuring shell patterns, wreaths and festoons. Rainier Square Tower (formerly Rainier Bank Tower and Security Pacific Tower), 1977 (Architect Minoru Yamasaki): Rainier Square Tower is a 514-foot modern skyscraper in the Metropolitan Tract of Seattle that sits atop an 11-story tapered concrete pedestal base, earning it the nickname "the beaver building." Architect Minoru Yamasaki designed the complex with the intention of retaining as much of the site for outdoor public use as possible. While passers-by might question the building's structural integrity, "the tower's perimeter acts as a Vierendeel truss, transferring wind loads to the pedestal while also making the building earthquake resistant. 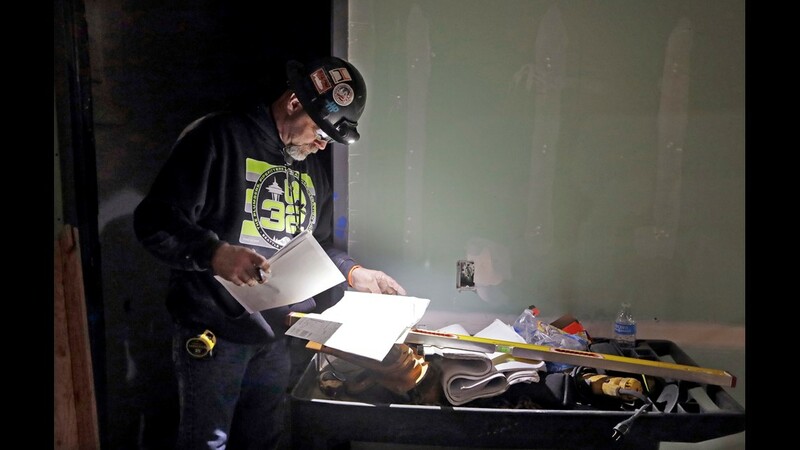 Results of the successful completion of 3 environmental tests prior to construction proved Rainier Tower as one of Seattle’s safest buildings." Grand Coulee Dam, 1933-1942 (Engineering: U.S. Bureau of Reclamation; Visitor Center Architect: Marcel Breuer): The Grand Coulee Dam is a concrete gravity dam on the Columbia River west of Spokane, built to produce hydroelectric power and provide irrigation water to the surrounding Columbia River Basin. The dam is one of the largest structures ever built — a mass of concrete standing 550 feet high and just short of a mile long. According to the National Parks Service, "Grand Coulee contains 12 million cubic yards of concrete, or enough to build a highway from Seattle to Miami." The visitor center was built in the 1970s and designed by Marcel Breuer to resemble a generator rotor. Expo '74 Center Arena (Architect: NBBJ) and Riverfront Park: Originally home to a complex of railroad yards, industry, and parking areas, adjacent to Spokane Falls, the site of Expo '74 (World’s Fair) was chosen by Spokane's civic leaders as an opportunity to redevelop and revitalize the area surrounding the downtown core. Taking their cue from the Expo's environmental theme, "Spokanites erected many buildings and opened up outdoor spaces, cleaned up the river - the seeds of which would later become Riverfront Park." Several structures built for the fair remain standing, including the Washington State Pavilion and the U.S. Pavilion, which remains an icon of the Spokane skyline. It is currently undergoing some reconstruction projects in phases, with plans to be completely finished in 2020. Rolling Huts, 2008 (Architect: Tom Kundig, Olson Kundig): Located in Mazama in Washington's Methow Valley, the Rolling Huts were designed to meet the owner's need for space to accommodate visiting family and friends. These simple, 200-square-foot steel and plywood volumes sit atop steel wheels, which elevate the huts above the flood plain and provide an unobstructed view of the surrounding mountains. According the the architects, "interior finishes – cork and plywood – are simple, inexpensive, and left as raw as possible." Each hut features a 240-square-foot covered deck and an adjacent portable toilet; full bathrooms and showers are housed in the centrally located barn a short distance away. Northwest Museum of Arts & Culture (formerly Cheney Cowles Museum), 2001 (Bora Architects, formerly Boora Architects): A combination of regional history, natural history and science, as well as culture and fine arts, the museum’s exhibits look to the broader world of science and art. The MAC campus also includes the historic 1898 Campbell House, library and archives, an auditorium and outdoor amphitheater. The exhibits and programs focus on three major disciplines: American Indian and other cultures, regional history and visual art. Boeing Everett Factory, 1967 (Boeing; NBBJ, renovation): The Boeing Everett Factory is an airplane assembly plant on the northeast corner of Paine Field in Everett. The factory is the largest building in the world by volume at 472 million cubic feet (98.3 acres). In 2006 Boeing added a digital graphic mural of a smiling woman, arms outstretched in celebration of flight, to the façade of its main building. In 2014 the mural was updated to depict four of Boeing's aircraft models in flight over the course of a day. The mural, like its canvas, is the largest of its kind in the world. Renton Public Library, 1966, 2015 (David A. Johnston and Johnston-Campanella & Company; The Miller Hull Partnership, renovation): Originally built in 1966, the Renton Public Library (Cedar River Library) straddles the Cedar River. A no-step main entryway in the middle of the exterior walkway allows the library and accompanying views to be easily accessible to all patrons. Although the building was constructed using state-of-the-art materials and techniques, by the mid-2010s the building was in need of renovation due not only to a deteriorating building envelope but also to changing needs. The 2015 renovation maintained the original superstructure but introduced a new energy-efficient exterior with floor-to-ceiling views to the river, allowing for more daylight. In 2016 the library was recognized with an AIA/ALA Library Building Award. Davenport Hotel, 1914 (Architect: Kirtland Kelsey Cutter): Commissioned in 1913 by a group of Spokane businessmen and designed by architect Kirtland Kelsey Cutter, the Davenport Hotel was the first hotel in the United States with air conditioning and a central vacuum system. Louis Davenport, the hotel's first proprietor and namesake, furnished this Spanish Revival masterpiece with the finest décor from around the world. The lobby ceiling, paneled with glass and supported by cast plaster beams decorated with faux wood graining, give the lobby an atrium-like feel. Today known as the Historic Davenport Hotel, the building is listed on the National Register of Historic Places. Gasworks Park, 1906, 1975 (Architects: Richard Haag; Jeffries-Norton Corp): Located on the site of the sole remaining coal gasification plant in the United States, Gasworks park is now a 20.5-acre public park on the north shore of Lake Union on the south end of Seattle's Wallingford neighborhood. The plant itself operated for half a century, from 1906 to 1956, and was bought by the City of Seattle for park purposes in 1962. After an intensive "cleaning and greening" operation to mitigate the soil and groundwater contamination caused by the plant's operation, the park was opened to the public in 1975. Among the park's features are a children's play barn repurposed from the plant's exhauster-compressor building and a kite-flying hill with an elaborate sundial at its summit. In 2003 the park was added to the National Register of Historic places. Museum of Glass, 2002 (Architect: Arthur Erikson): Developed in tandem with Tacoma's initiative to redevelop the Thea Foss waterway, the Museum of Glass is both an architectural and cultural icon, as well as a tribute to glass artist and Tacoma native Dale Chihuly. The museum is famous for its 7,000 -square-foot conical hot shop, where visitors can watch master glassblowers at work. The angled cone, composed of 2,800 diamond-shaped stainless steel panels, was inspired by the wood "beehive burners" of the sawmills that once dotted the waterway. Visitors can access the museum from downtown Tacoma’s cultural corridor via the Chihuly Bridge of Glass, a 500-foot-long pedestrian overpass designed by architect Arthur Andersson in collaboration with Chihuly. Smith Tower, 1911-1914 (Architect: Gaggin & Gaggin): Seattle's oldest skyscraper, this 38-story Neoclassical tower was the tallest building west of the Mississippi at the time of construction, and remained the tallest building on the West Coast for nearly half a century until it was surpassed by the Space Needle in 1962. Visitors today can ride the original elevators to the 35th-floor Observatory and enjoy the panoramic views from the open deck or indulge at the speakeasy-style bar. The building is a Designated Seattle Landmark. Washington Fruit & Produce Headquarters, 2016 (Architect: Graham Baba Architects): Located in the Yakima River Valley, the new Washington Fruit & Produce Headquarters is a 16,5000-square-foot building situated in a hillside of the 23-acre site. Designed by Yakima native Brett Baba of Graham Baba Architects, the commercial office building was inspired by an aging barn on the road to Naches, and 16,000 square feet of reclaimed barn wood were used for both the interior and exterior of the structure. Energy reduction was also integral to the design, and taking advantage of Yakima's sunny climate, the tall window wall drastically reduces the need for electric lighting. The Washington Fruit & Produce Headquarters is the winner of many awards, including the 2017 Architizer A+Award in the Commercial-Office Low-Rise category and a 2016 AIA Seattle Honor Award of Merit.